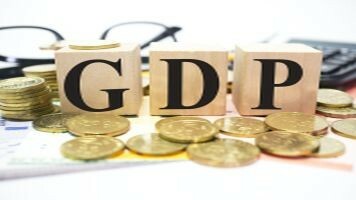 Nearly four years after moving to a new GDP series, the Union Ministry of Statistics & Programme Implementation (MOSPI) on November 28, 2018 released the revised Gross Domestic Product (GDP) data for the years 2004-2005 to 2010-2011. Modifying the data of past years using 2011-12 as the base year instead of 2004-05, the Central Statistics Office (CSO) lowered the GDP growth rate under the United Progressive Alliance (UPA) Government from 10.3 percent in financial year 2010-11 to 8.5 percent. 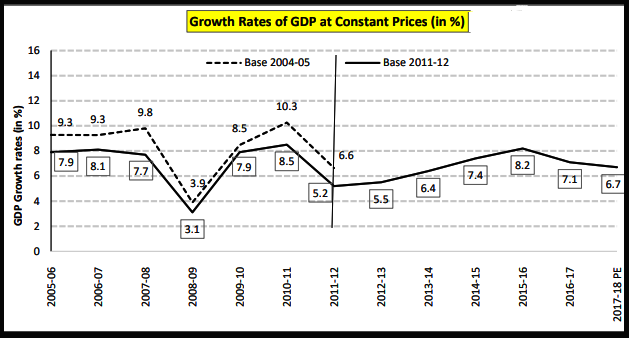 The new numbers show that India's economic growth rate for 2005-06 to 2011-12 averaged at 6.7 percent. The previous numbers had put the average growth rate during the UPA rule at 7.75 percent. It was in February 2015 that the CSO worked out a new formula with 2011-12 as the base year and the new GDP series was announced. At that time, they had revised the new GDP series from 2012-13 onwards. Since then, all GDP data whether quarterly or annual have been calculated based on new series. Answers to all your Whys? Why is there a need to change the Base Year? The Base year is periodically revised to uncover the structural changes that have taken place in the economy over time and to depict a better picture of the economy through Gross Domestic Product (GDP), National Income, consumption expenditure and other related aggregates. Why was 2011-12 chosen as the Base Year? The Central Statistics Office (CSO) uses the estimates from the results of Quinquennial Employment and Unemployment Surveys (EUS) of National Sample Survey Organisation (NSSO), which are conducted once in every five years, for revising the base years of national accounts statistics once in every five years. The change in the base year also coincides with the years for which the NSSO conducts the Quinquennial Employment and Unemployment Surveys. The 61st Round Quinquennial EUS 2004-05, based on which 2004-05 was chosen as the Base Year, was followed by a Quinquennial EUS in 2009-10. However, the 2009-10 was not considered as a “normal” year since it succeeded the Great Recession of 2008. Hence, a fresh EUS was conducted in 2011-12, the results of which were used for the compilation of the estimates in the new series with base year 2011-12. The year 2011-12 saw the GDP deflator as the highest in the last 10 years. The GDP deflator is an indicator of system inflation that is used to convert nominal GDP to real GDP. Why Government gives out the ‘Back Series’ GDP data? The back series data serves as a link between the old and new methodology of calculating the GDP. After introduction of the new base year of National Accounts, the back-series estimates of National Accounts Statistics (NAS) are compiled and released for the years preceding the new base year for completeness and comparability with old base data sets. Why the revised GDP data fuelled political row? Seeing the downward revision of India’s growth rate during the Congress-led UPA regime from 2004-05 to 2010-11, former Finance Minister P Chidambaram slammed the back series GDP data and called the revision a "bad joke." Responding to this criticism, Union Finance Minister Arun Jaitley said that what was welcomed by the UPA in 2015 is now being criticised because the GDP growth has been revised downwards. In 2015, the CSO revised the GDP growth of the last two years of the UPA that is 2012-13 and 2013-14. At that time, the GDP growth was revised upwards. At that time, the revised GDP was welcomed by the UPA government. He further added that a highly credible organisation like CSO has global credibility and no one has ever alleged motives to it. The revised numbers are globally more comparable as they take into account a far greater representation of the Indian economy and are more reflective of its real state. The revision of GDP work was started by the CSO under the then chief statistician TCA Anant who changed the base year from 2004-05 to 2011-12 and updated the methodology to calculate the GDP to be in line with internationally accepted standards. This new methodology uses a lot of data from the Ministry Of Corporate Affairs database of corporations (MCA 21) as well as the production shift method. The problem is that MCA 21 was available only from 2006-07 and thus could not be used for earlier GDP calculations. However, this MCA 21 data stabilised and could be used only 2010-11 onwards. This was a reason that the CSO under TCA Anant only released the back calculation till 2010-11. What do you mean by ‘GDP’? The Gross Domestic Product (GDP) is the final value of the goods and services produced within the geographic boundaries of a country during a specified period of time, normally a year. GDP growth rate is an important indicator of the economic performance of a country. The Nominal GDP comprises the absolute values of goods and services produced in the country in a particular year. In order to compare and know how the economy is growing, the figures of Nominal GDP need to be brought under a 'constant' base year. This becomes 'Real GDP'. What is a ‘Base Year’? A base year is the year used for comparison for the level of a particular economic index. It gives an idea about changes in purchasing power and enables calculation of inflation-adjusted growth estimates.